With the school year in full swing and a busy month of birthdays, out of town guests and costume parties, it’s sometimes hard to carve out time to cook. Fortunately, this lack of time coincided with the end of tomato season, a confluence that naturally led to cooking a big batch of tomato sauce that we could freeze for nights when boiling pasta water is about all the cooking energy we can muster. 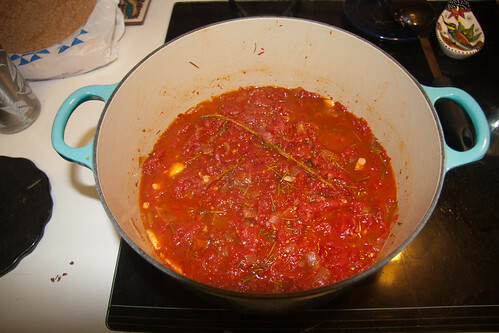 Tomato sauce was at least a weekly staple in our home when I was young, and it was also one of the first things I learned to cook after going to college. My recipe, which has served me well for over a decade, uses tomatoes, an onion, a few garlic cloves, salt, red wine and a whole lot of (ideally fresh) rosemary. We ordered a load of roma tomatoes from Gauchito Hills Produce, a CSA started by a couple of our friends. Ripe roma tomatoes are ideal for tomato sauce, having a great balance of flesh and juice. 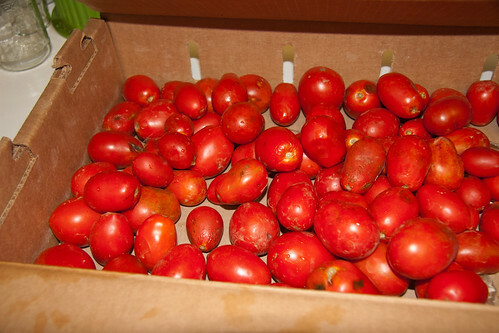 The end of the season romas were soft and super ripe. I couldn’t wait to get them peeled and into a large pot. I washed the tomatoes then cut an X on the bottom end of each one and placed them in a pot of boiling water to loosen the skin. 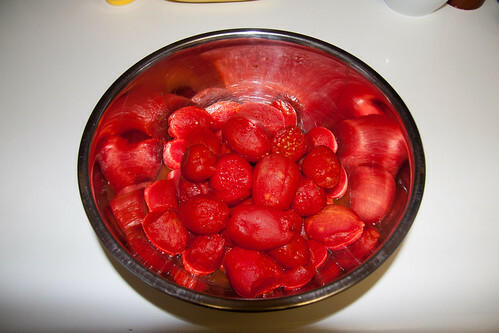 After each tomato had soaked for five or ten minutes, I pulled them out and let them cool to where I could remove the skin. 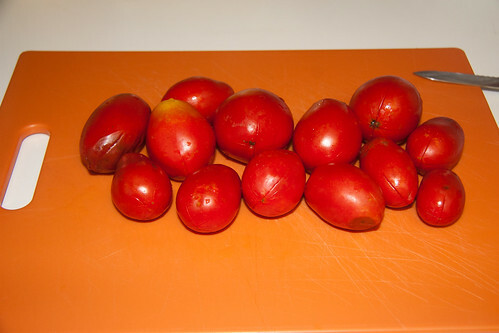 I sliced the tops off them as well, and soon had a large bowlful of whole, peeled tomatoes. I chopped an onion and peeled and smashed five or six garlic cloves then tossed those in a large pot with some olive oil to sautÃ©. 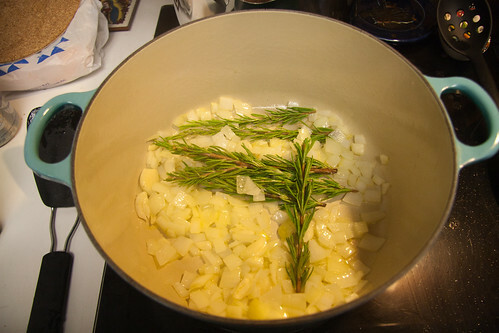 On top of this, I added three sprigs of fresh rosemary. After the onions were translucent, I poured in the bowl of tomatoes, followed by red wine and some salt, then covered them to simmer over low heat for three hours. 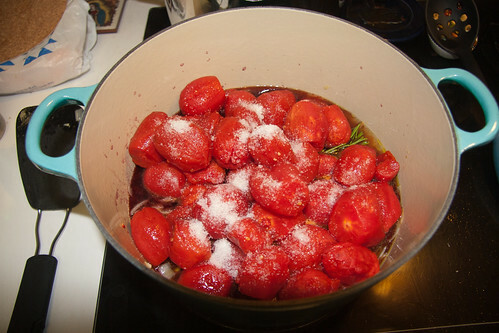 I mostly left the tomatoes untouched while they cooked, only taking a minute to break them up midway through. After three hours they had caramelized a bit, and darkened to a familiar tomato sauce hue. I removed them from heat and let the sauce cool. 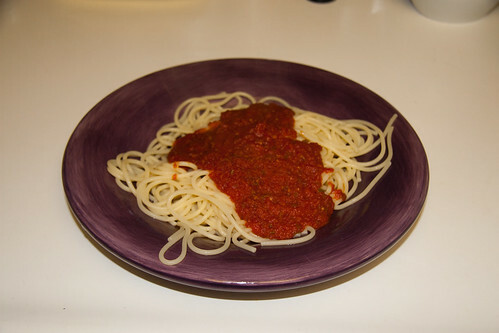 When it came time to eat our first tomato sauce meal, I pulled the full batch of sauce from the fridge and purÃ©ed it all in the food processor. 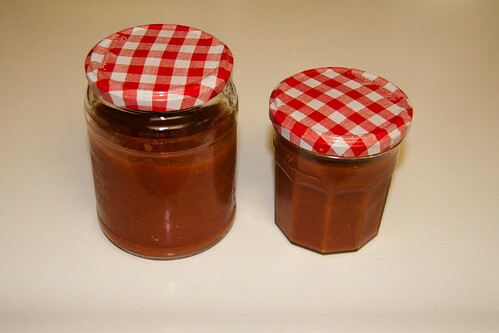 After reserving a portion to heat for dinner, I poured the rest of the sauce into a couple jars to freeze. We enjoyed the first round of tomato sauce over al dente spaghetti, with some freshly ground pepper and freshly grated parmigiano reggiano.